Millennials make up the largest generational population within the U.S., according to The White House Council of Economic Advisers. The term "Millennial" points to anyone born between 1980 and 2005. What's even more remarkable about this particular demographic than the vastness of its size, is the fact that Millennials are undoubtedly changing the American landscape. They are more educated, racially diverse, and technologically savvy than any other group in history. More than 60% are college educated, and almost half identify with a race other than non-Hispanic white. 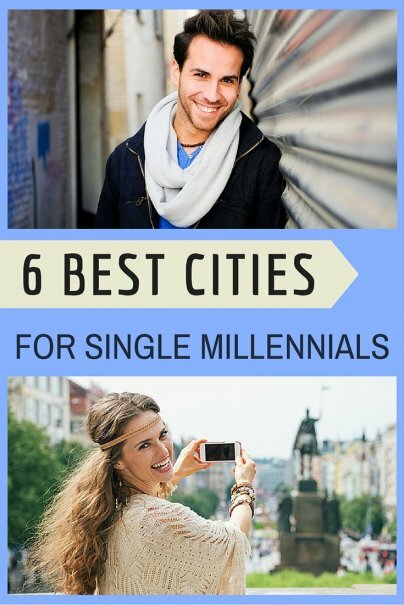 As a career-driven Millennial, who's likely to put off starting a family until later in life, here are the six best cities for singles. Austin's reputation as the nation's live music capital, with more than 200 live music venues and year-round festivals, has lured singles from across the country. Single females outnumber single males two to one. Austin has a relatively low cost of living and booming business economy. The Milken Institute, a Washington, D.C. based think tank, ranked it one of the top five best-performing large cities for 2015. Dallas/Fort Worth was the only other Texas city to make the list. Its economic growth has been attributed to the low cost of doing business and corporate recruitment incentives. Today, Dallas (and area cities) has become the corporate headquarters for many large companies, translation; opportunities, which should appeal to a lot of career-oriented Millennials. Dallas is also known for it's steamy culinary scene and renowned chefs that have brought their sought-after fare to the area. The City of Angels didn't make the list of best-performing cities. LA might not be the ideal place to launch your career — that is, unless of course, you're in search of fame and not only fortune. Los Angeles has not slowed down or lost momentum as a magnet for ambitious Millennial hopefuls wishing to get their start in Hollywood rather than Silicon Valley or Silicon Alley. The city's hot spots are filled with beautiful single men and women. The LA Times says, most adults in Los Angeles are single and make up 55.8% of the adult population. Bienvenido a Miami! You won't find Miami on a list that rates cities based on their economic growth. That is because the major industries in Miami are limited to travel and tourism, hospitality, and real estate. The median salary is lower than most other large cities. However, its coastal location, tropical climate, and ostentatious nightlife scene has made it a global center for jetsetters. Miami has a growing population of internationals and single Americans who call it their second home and flock there each November to February. There are more available men and women under the age of 36 in Gotham City than any other major city in the U.S. According to the New York City Economic Development Corporation, New York City bars and restaurants generate 58% more revenue than those in the United States as a whole. So, if you can stomach the high cost of living (average rent is $2,800 per month), giving up your personal space, noise, and trading in your car to ride a crowded subway to work every day, I'm willing to bet you'll begin to feel at home in no time. San Francisco has one of the most vibrant economies in the U.S. Aside from the high cost of rents (average rent is $3,500 per month), it's a nice place for singles to live. According to The Milken Institute, the tech capital led the nation in wage growth for the last five years. Research showed that "San Francisco's tech-fueled growth is drawing young knowledge workers from around the country and the world." Where should a single 20-something on the just beginning adult life reside?